When I walked in the store, I was immediately drawn to this Katia yarn called Temis and ended up buying two balls. It wasn't until I started knitting with it later that afternoon that I realized I had worked with it a couple years ago. I guess my tastes haven't changed. I love the variations in weight and texture. When my mom saw me knitting with it she expressed how much she liked it, so I decided to knit her a scarf for Mother's Day. 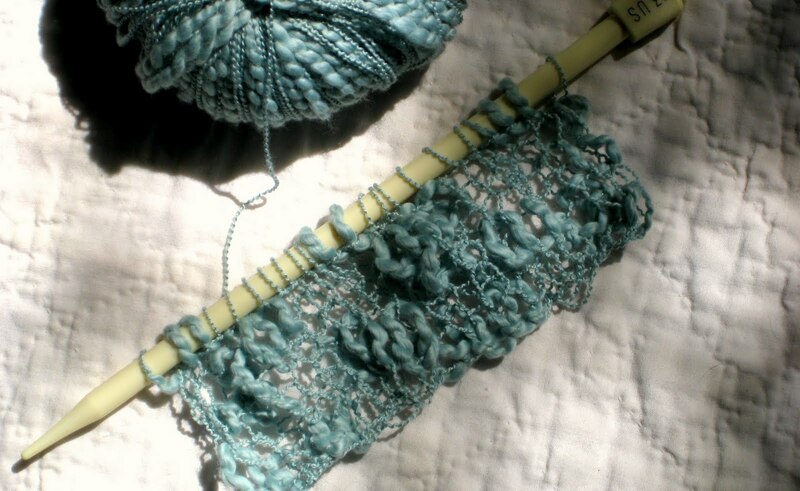 I just started it today, but wanted to show you how interesting it looks when knit. I'm using size US 13 needles on a 2x2 rib. Please forgive the shadowy and dappled photos. I took them out on the patio because I don't want to miss a minute of this nice spring weather we are finally having. This is the mystery project I've been working on. It's a baby blanket that I have been trying to finish before my sister's shower in a couple weeks, but I realized today that I just can't get it done. (I was also trying to keep it a secret, but I gave up on that, too.) That's okay, I'll give her the yellow blanket and save this one for the holidays. It's a feather and fan pattern on worsted weight. I want to give a special shout out to Stephanie of Tiny Owl Knits for donating two patterns to give away to my Ravelry group. If you haven't seen her designs, you are in for a real treat. Lucky mom to be getting that scarf. Oh my friend, what beatiful yarn that you are using for your Mom's scarf! GORGEOUS! Hope you are enjoying your weekend! I waved at you when I flew over going and coming:) HUGS! Oooh, that yarn is gorgeous -- I just love the yummy blue. Yarn and chocolate -- isn't that a song -- go together like love and marriage or something like that LOL! I heart Napa...and chocolate...and yarn. I really like the start of the scarf. Your mom will love it! 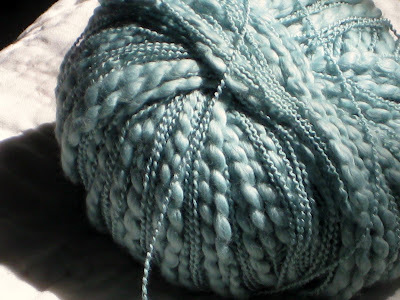 LOVE the blue yarn!!! YUM! 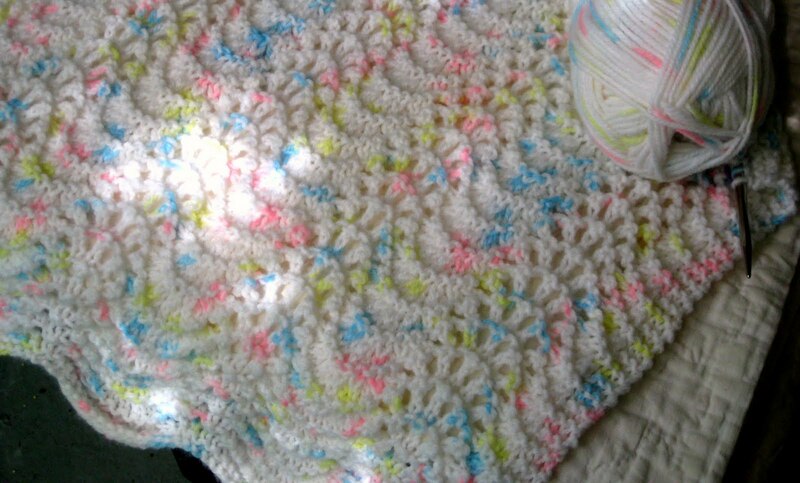 The baby blanket is very pretty. Love the yarn. What a beautiful colour! Your lucky mom! You feather and fan blanket is looking great too. Mmmm...I really want to soak in the tub you showed in your previous post. Stacy, that yarn is just yummy! Your mom is going to love the scarf. I think yarn and chocolate are perfect things to spend vacation money on. The blanket for your niece will make a lovely holiday gift. Enjoy the rest of the beautiful weekend weather. Oh, and give Charlie a little pet. Nice new yarn and the feather and fan blanket is looking great. Oh it's so pretty. What a nice present for your mom! And your sister will be thrilled. You are a generous knitter! And what more could there be than yarn & chocolate? OOOOH...I love that yarn. I'm sure it'll make a wonderful scarf, what a lucky MOM! Your work is so Lovely! i always enjoy and am inspired by your beautiful posts.